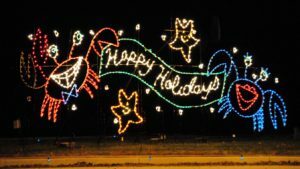 Come and join the 5K Run through Anne Arundel SPCA’s fabulous holiday show – Lights On The Bay at Sandy Point State Park! For one night only, you and your family can leave the car behind and get a running start on the holidays with Santa, hot chocolate and cookies at the finish line! No pets, headphones, strollers, or baby joggers please! Registration is available at $55 per carload for up to 5 runners as an alternative to the traditional $15 per individual. All payments benefit the Anne Arundel County SPCA. Gates open between 5 and 6 p.m., then close to all traffic at 6 p.m. for race start at 6:15 p.m. Spaces are available for only approx. 200 cars. No parking on road or outside of park is permitted. No walk-ins permitted. Due to insurance regulations safety issue: NO wheels, headphones, pets, baby joggers, or strollers etc. permitted during the event. STRICTLY ENFORCED! Admission charge per car or minivan includes up to 5 occupants. Additional passengers $15.00 each person including non-runners to be paid at gate. Advanced ticket purchase strongly advised due to limited parking. Bring completed application, printed ticket voucher or check payable to SPCA on race day. Tickets are non-refundable but can be exchanged for light show pass Nov. 21st - Jan 1st. Register online until Thursday Nov 15, 2018. Mail registration by Friday Nov 09, 2018. The entire course is smooth and flat asphalt, lit by holiday displays. Two speed-bumps are marked with small signs and lights. 2) The 5K runners follow the same course, but also an ADDITIONAL LAP UP AND DOWN THE MAIN PARK ROAD for .9 miles more to reach 5K / 3.1 miles. (The start and finish line are the same location as for Fun Run.) THERE IS NO REPETITION OF THE THREE FUN-RUN, LIGHT-DISPLAY LOOPS! As a fun-run, this race is not certified or scored. A time-clock enables runners to record their own time. Small flashing-light medallions are given to each 5K / fun run participant. Park gates are open between 5 and 6 p.m. No entry is permitted after 6 p.m. Bring completed online application, printed ticket vouch or check payable to SPCA on race day. These are checked at park entry-booth and collected at registration table near start line. Awards Presentation: 6:45pm. First three finishers adult males, adult females, and children 12 and under will receive medals. Volunteers are asked to contact Phil as soon as possible at philip@annapolisstriders.org ! Email LightsOnTheBay5K@annapolisstriders.org to contact the race directors. This entry was posted in 5k, Registration on October 15, 2018 by Lights on the Bay 5k Director.